The first Republican woman elected to Congress from Maryland, the Honorable Marjorie Sewell Holt, has fulfilled many roles, including great-great-grandmother and Jacksonville University alumna. Even in its seminal days, JU sparked lifelong passions and encouraged students to be fearless. At 97, Marjorie remains one of the most significant influencers of national politics from Maryland. Born in Birmingham, Ala. on Sept. 17, 1920, to Edward and Juanita Sewell, she was the oldest of four sisters and remembers moving to Jacksonville at age 5. It was here on Florida’s First Coast that Marjorie spent her childhood, attended Andrew Jackson High School and eventually graduated from Jacksonville Junior College, a.k.a. Jacksonville University, in 1945. She credits an early civics instructor who encouraged her curiosity about government and law, but she also acknowledges that her father had much to do with setting her on a trajectory that would include law school, campaigns, elections and a life of public service. She met another important man in her life, Duncan M. Holt, while registering for classes at JU. She loves to tell the story of standing in line with a friend in front of two young men, with Holt behind them. The two had just returned from flying bombing raids in World War II and at least one had his eye on Marjorie. “My father immediately pushed the other two guys out of the way,” says Vicki Perry, one of Marjorie’s three children. Holt was determined to get Marjorie’s phone number before the other GI’s did. Perry Como first recorded “Prisoner of Love” in 1945, and a year later it was topping the charts. Marjorie remembers the song well and tells about one of her first dates with Duncan at Jacksonville Beach. While she stepped into the “bath house” to change into a swimsuit, Duncan arranged for “Prisoner of Love” to blast through nearby speakers from a shop along the Boardwalk. It quickly became their song, Duncan feeding his pocket change to every jukebox they encountered from that day forward. “We laugh at that story today, and I remind her that Dad is in Heaven playing that song over and over while he waits for her,” says daughter Vickie. Marjorie lost Duncan to natural causes in 2014, after 67 wonderful years of marriage. During that time, she built an impressive political career that stretched from Ann Arundel County, Md., all the way to Washington, D.C. and the Oval Office. She moved to Maryland shortly after earning a law degree at the University of Florida and graduating in the top two percent of her class. Getting accepted into UF’s law school was an impressive feat in itself, with thousands of GIs returning home from war across the nation and competing for the same coveted spots. That year, Marjorie was one of only five women in her class of 500. She was one of only three to graduate. While raising her two daughters, Rachel and Victoria (Vicki), and one son, Edward, she joined the Republican Party of Maryland, began practicing law in 1962, and was appointed Supervisor of Elections in her county. Still keen on entering elected public office, Marjorie’s focus eventually landed on the Clerk of the Circuit Court seat, and in 1966, she defeated the Democratic incumbent, something rarely heard of in Anne Arundel. The landslide vote was considered one of the biggest upsets in county politics at the time. Her election ushered in far more than a fresh face and new party. It also signaled the beginning of the Court’s modernization, streamlining, and use of computers. She attended the Republican National Conventions of 1968 and 1972 as a Maryland delegate, maintaining roles of influence and leadership within the party back at home. A Congressional seat remained her heart’s true desire, as well as her long-term goal professionally. And in 1970, she edged a little closer to that dream with the re-apportionment of Maryland’s Congressional districts, resulting in the creation of the state’s Fourth District, previously nonexistent for residents of Ann Arundel County. As smoothly as she won the Clerk of Circuit Courts election, she did the same in 1972, defeating another well-established Democrat and becoming the first of her party sent to Congress to represent Maryland. She served as a member of the U.S. House of Representatives beginning Jan. 3, 1973, and was re-elected to six additional terms. “My whole pitch was less government,” Marjorie said. Her platform included a reduction in the size of the federal government, cuts in nonmilitary spending, and differing from the majority of her contemporaries when it came to issues such as taxes, wage control and desegregation. She was by no means a follower. Nor was she interested in the status quo. Over the span of her Congressional career, she served on the House Committee on the Budget, the Joint Economic Committee, and was a member of the Houses Armed Services Committee for the duration of her tenure, making her its second-ranking member. She was also recognized as an unofficial but duly-respected spokeswoman for the military and a consummate protector of military spending. Marjorie had many near-victories and several stellar moments during her 14 years in Congress, including her role as a champion for more local control over education and authoring the bill establishing the Urban Homestead Program, through which the Department of Housing and Urban Development (HUD) reclaims and rehabilitates abandoned properties, affecting communities still today. 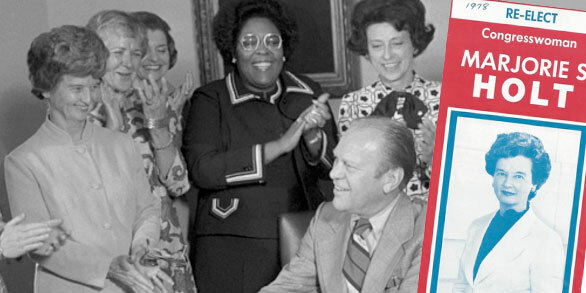 Most notably, Marjorie earned the nickname “Mother of Supply-side Economics” for her efforts to reform and reduce the 1979 federal budget by $20 billion. Despite its defeat that year, Marjorie’s work became part of an amendment carried out during the Reagan administration. Among her many accolades and accomplishments is co-authoring a book in 1976, The Case Against the Reckless Congress, and serving as the chairwoman of the Reagan-Bush campaign for the 1984 election. When she was no longer a candidate for re-election to her Congressional seat, President Ronald Reagan nominated her to the General Advisory Committee on Arms Control and Disarmament, a group of private citizens who reviewed sensitive material and studied the long-term pattern of Soviet arms control obligations and unilateral commitments. Not only did this committee of trusted and seasoned members, like Marjorie, produce the “annual report [which] shall be transmitted under an injunction of secrecy,” according to U.S. Statute 1444, but it also had a great impact on the politics surrounding the Cold War. In a 2006 interview with a local Annapolis magazine, Marjorie said, “Maybe I could have gone farther.” At the time, she was a grandmother of eight and 85. It was widely known that Marjorie went to great lengths to keep in personal contact with constituents and to listen. One of her mantras was that no problem was too big or too small, and it was this philosophy that made her one of the best-loved politicians in Maryland. The people of Ann Arundel, what she considers her home county, have not forgotten her, and neither did their confidence waver in her role as their voice on the Hill. Marjorie Sewell Holt, JU alumni and catalyst for change, took very seriously the lives, trust and interests in her keeping. She is incredibly proud of her alma mater and particularly enthusiastic about JU’s establishment of its own Public Policy Institute.